The Galaxy M10 is a good looking phone that handles the basics very well. Performance seekers should look elsewhere. At a time when Xiaomi, Realme and Honor are giving Samsung an extremely tough time in the entry-level segment, the South Korean company has finally decided to sit up and take notice. The all-new Galaxy M10 and Galaxy M20 are aimed at a millennial audience and, as such, are focusing on features like design, long battery life and camera capabilities. But will this be enough to combat the incessant Chinese onslaught? We find out in our Samsung Galaxy M10 review. The Galaxy M10 doesn’t stray too far from the basic design principles of Samsung’s other mid-range hardware. The all-plastic build is utilitarian at best, but the company seems to be going for overall robustness than a flashy design. The phone feels like it could take a beating and come out looking just fine. That’s not to say that nothing has changed. Compared to Samsung’s On or J series, the M10 certainly takes a more modern stance. The front of the phone makes use of a waterdrop-style notch and has fairly minimal bezels to boot. The Galaxy M10 feels comfortable to hold and looks premium while at it. Galaxy M10 seems to be going for overall robustness than a flashy design. The phone feels like it could take a beating and come out looking just fine. Continuing on to the ergonomics, the volume rocker and power buttons placed on the right side of the phone are easy to reach out to. The buttons have great feedback and do not have any unnecessary rattle, something many budget phones are guilty of. Along the button of the device is a Micro-USB port for charging. We understand the need to retain familiarity of components at this price point, but a UBS-C port would have definitely helped the phone stand out compared to competitors. Next to the charging port is a headphone jack. The speaker grille on the other hand is at the back of the phone, so sound gets muffled if you are playing music with the phone kept down on a table. The speaker also doesn’t get all that loud. Music reproduction is strictly average and, though the speaker doesn’t sound too shrill, there is also no bottom end to the music. The back of the phone is where the design gets a bit more pedestrian. A subdued Samsung logo and the dual camera array aside, the phone doesn’t really have much else going on. The plastic used doesn’t feel premium and the simple matte blue finish looks a bit dull compared to the metal or gradient-style designs that many other brands employ. The Galaxy M10 has a 6.23-inch LCD display with an HD+ resolution. Clocking in at 720 x 1520 pixels, the screen is definitely not the sharpest around and everything from images, videos to text looks just a bit too soft. That said, the display is very vibrant and generally looks quite pleasing. We noticed a very slight amount of color shift at extreme angles, but this is something that won’t really concern most users. Unfortunately, there is no granular control over color temperature and saturation levels. While the screen is perfectly visible indoors, you might want to turn off automatic brightness control when outdoors to crank up the display brightness to maximum. It is still not ideal, but pushing up the brightness manually goes a long way in getting over the highly reflective display. I also found myself reaching for the font settings under the display options. By default, Samsung has opted for a really large font that reduces the amount of visible text in system apps. Like most Samsung phones, you can also change the font straight from the Settings app though the company’s taste in font choices is questionable at best. While it's vibrant, the screen is definitely not the sharpest around and everything from images, videos to text looks just a bit too soft. The biggest change is the teardrop notch on top. Samsung calls the panel an Infinity-V display due to the “V”-shaped cutout at the top housing the front facing camera. There is no software setting to hide the notch. However, you get used to it very quickly and over the course of the review period, the notch was never an impediment in usage. The Galaxy M10 uses the same internals as the Galaxy J7, which makes it obvious performance isn’t really the focus here. The phone is powered by an Exynos 7870 Octa system-on-a-chip which is pretty ancient as far as chipsets go. The Exynos 7870 has eight Cortex A53 cores clocked at 1.6GHz, making it less powerful than the Snapdragon 625 used by competing devices like Xiaomi’s Redmi 6 Pro. The chipset was announced back in 2016 and as such is getting really long in the tooth. The variant we tested out has 3GB of RAM onboard, as well as 32GB of storage. There will be another lower priced variant too with 2GB of RAM and 16GB of storage. On our 32GB variant, there was about 22GB of storage free at first launch, but onboard storage can be expanded further. We were quite happy to see that the Samsung Galaxy M10 has dual-SIM card slots as well as a dedicated microSD slot as well. For the target demographic, this is definitely desirable, as many competitors have switched over to hybrid slots. The Galaxy M10 supports VoLTE on both SIM card slots as well. Performance on the Galaxy M10 is strictly adequate, which doesn’t come as much of a surprise. The company has done a pretty good job optimising the software, and, as such, day-to-day performance isn’t too bad. The phone certainly isn’t buttery smooth and there are a few stutters and frame drops on occasion but not to an extent to be a dealbreaker. With just 3GB of RAM, we had low expectations from the memory management, but the phone does decently well here. Switching between a game like PUBG, the browser, and the camera app was sluggish but manageable, and the phone held the game in memory while we went around taking photos and answering a call. We had low expectations from the memory management, but the phone does decently well here. Talking about gaming performance, the Mali 830 GPU is the Achilles’ heel of the chipset. Graphics performance is quite poor and you’re in for disappointment if you plan to do a bit of gaming on the Galaxy M10. Even at the lowest settings, PUBG could not hold a steady frame rate. Textures looked blocky, draw distance was very poor, and we noticed a lot of texture pop-in. Let’s talk about the network performance of the phone. I’m in a very poor network area, but the phone did reasonably well at latching on to a network. Not as good as Honor’s budget phones though. Once the phone did manage to connect to Airtel’s network, phone calls sounded absolutely loud and clear. No complaints. Would it surprise you if I told you I like what Samsung has done with the Galaxy M10’s software? Sure, it doesn’t run the latest and greatest Android 9 Pie, but Samsung Experience 9.5 UI, mated to Android 8.1.0, provides a very cohesive and optimized experience. The phone offers a familiar experience to the long-time Samsung user, while giving enough customization options to please a more demanding audience. The lock screen starts off with a magazine style view that displays the latest news from your topics of interest. Called Lock Screen Stories, you can disable it in settings. The same goes for the home screen layout, which can be switched between an iOS style, app-first layout and one with a standard app drawer. The phone ships with a few pre-installed apps including Office, OneDrive and LinkedIn, and none of these can be uninstalled. The Dailyhunt news app, on the other hand, can. Samsung has done a brilliant job with gestures on the phone and that makes navigating the interface a breeze. There are options to change the button order as well as a translucent bar that hovers along the bottom edge to help out first time users. On a screen as large as the M10’s, navigation gestures make using the phone a lot more enjoyable. Finally, since the phone doesn’t have a fingerprint scanner, facial recognition is the only option to unlock your phone using biometrics. Unfortunately, it works way too slowly to use in anything but perfect light to be a credible option for everyday use. I did, however, like the bit of animation that Samsung has added around the notch to indicate the facial recognition at work. It’s all about the little things! Like practically every other phone in the category, the Galaxy M10 sports dual cameras at the back. Where the phone differs though is that, instead of a questionable depth sensor, the phone has a much more useful 5 megapixel ultrawide secondary camera. This, combined with a 13MP primary camera, makes it a pretty versatile shooter, at least on paper. Outdoors, the camera manages just about passable shots. The images exhibit very limited dynamic range and details are often lost in shadow regions. Similarly, the highlights are blown out more often than not, resulting in washed out shots. The camera’s party trick however is the 5MP secondary camera. The ultrawide camera is similar to what you might have seen on LG’s phones. As the name suggests, with a 120-degree field of view, you can capture a whole lot more of the scene in your images, be it monuments or just a larger group of people. We observed significant distortion at the edges, but that’s the price you pay for an ultrawide lens. Results from the secondary camera were low on details and quite noisy in less than ideal light. Still, the flexibility can’t be beat and I’ll take an average wide-angle sensor over a questionable monochrome camera. Low light photos from the Galaxy M10 are high on noise and low on details. Low light photos from the Galaxy M10 are high on noise and low on details. This gets even worse when you pop over into the ultrawide mode. The phone does not have a dedicated night mode and, while you can use the Pro mode to improve on the image quality, you won’t be getting much better results out of this camera. Talking about the front camera, the phone defaults to using a smart beauty filter that completely smoothens out skin and brightens it up as well. I’m not a fan of this but it takes just a quick tap to turn it off. I suppose it makes sense for a phone targeting a social media-addicted audience, but do people really want all their photos touched up? I’d love to hear your comments below. Even with the filter turned off, the 5MP camera doesn’t resolve a lot of detail and images turn out ever so slightly blurry in anything less than perfect light. The Samsung Galaxy M10 has a 3,400mAh battery, which is about standard for this category of phones. Samsung has done a great job at extracting great battery life out of the hardware. Without resorting to aggressive battery management, the phone manages to handily last a full day of use and then some. In a video loop test with the brightness levels at the halfway mark, the phone lasted over 18 hours of continuous playback. With a mixture of gaming, social media and web browsing, the phone delivered well over 6 hours of screen-on time on average during our testing period. Overall, the M10 lost just about 5 percent charge over the course of a thirty minute PUBG session. Suffice it to say that the Galaxy M10 is a very frugal device. There is no fast charging support on the Galaxy M10 and a full charge using the included charger took about 2 hours and 15 minutes. If all you want is a well-built, modern-looking phone that does the basics, the Galaxy M10 is a surprisingly solid option. Should you buy the Galaxy M10? The Galaxy M series of phones represent Samsung’s renewed focus on a younger audience. Unfortunately for Samsung, that same audience cares just as much about features and specifications as much as a great experience. The lackadaisical performance, missing fingerprint reader, and average camera performance certainly aren’t doing the Galaxy M10 any favors. 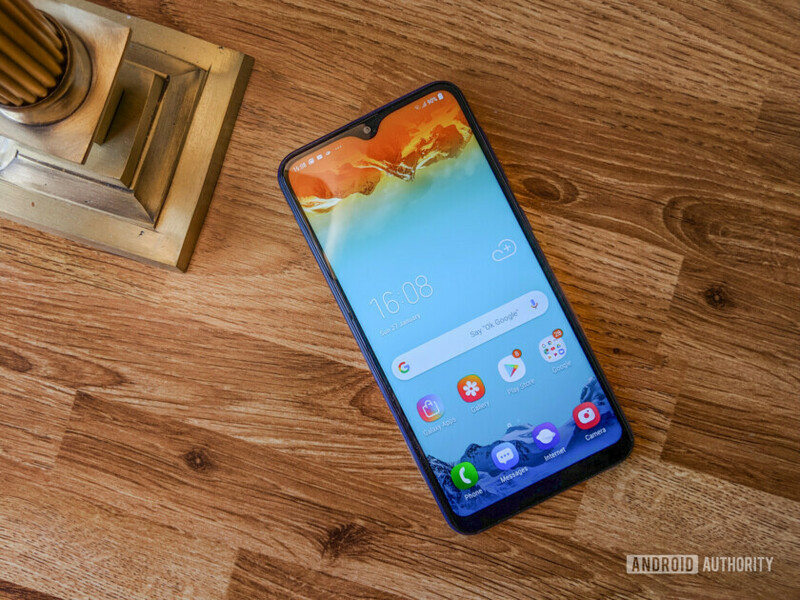 Pricing for the Samsung Galaxy M10 starts at Rs. 7,990 for the 2GB RAM variant and goes up to Rs. 8,990 for 3GB of RAM and double the storage. If all you want is a well-built, modern-looking phone that does the basics, the Galaxy M10 is a surprisingly solid option. The Samsung Experience interface is functional, smooth enough, and has a plethora of options to tweak it to your preferences. For anyone looking for a bit more grunt in the hardware department, you might be better served by Xiaomi or Realme’s phones. The Redmi 6A and Realme C1, in particular, stand out as credible alternatives to the M10. And that’s it for our Samsung Galaxy M10 review! Will you buy your phone? Stay tuned for our Galaxy M20 review, coming soon.